Tables will be provided for display. No need to deliver early. Bring them with you. Free admission. Refreshments. Family Friendly. CINDY HOEDEL is a national award-winning journalist who worked at the Kansas City Star for 20 years and writes for IN Kansas City magazine. She is best known for long-form stories, profiles, and essays about her transition from urban Kansas City to a tiny town on the Kansas prairie, where she grows food, keeps chickens and helps community groups and small businesses raise their profile by harnessing the power of words. Add your voice to an open-circle conversation as Cindy elicits observations and impressions. Cindy says, “Through targeted questions we will create a crowd-sourced word portrait of these Flint Hills that we love as a home, a favorite landscape or a sanctuary.” She describes it as a pointillist painting “that uses tiny dots of various pure colors which become blended in the viewer’s eye….with the aim of producing a greater degree of luminosity and brilliance of color” (definition adapted from the dictionary). This will be an exercise in producing art as a group – Cindy will record the conversation, the gathered responses and impressions, and then at the Closing Reception of “Encircling Vastness” on October 14, she will share a piece of writing that results from this. 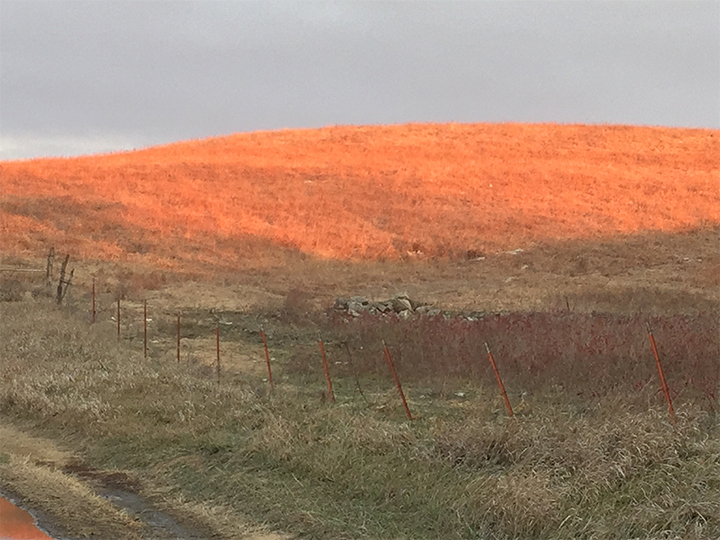 It will be an appropriate finale to the exhibit and programming about Place in the Flint Hills.